Valentine’s Day is already upon us. That was quick. Feels like just yesterday that we compiled last year’s list of the worst Valentine’s Day gifts ever, which is still relevant (unlike Justin Timberlake). Regardless, it’s here. And if you think of things in terms of golf holes, which I often do, then Valentine’s Day might look a lot like rolling up to the 17th at Sawgrass with only one ball in your bag. You either hit the green or you’re going home. On this particular holiday, either you’re single and have nothing to worry about (except the thought of eternal loneliness amped up just a notch) or you’re in a relationship feeling the pressure of getting the perfect gift. And with regard to that, you better have your wits about you because I’ve seen things go horribly, horribly wrong. But rest at ease, chief! As always, I’m here looking over your shoulder as the sensible, soothing voice of reason. A sage in a caddie suit. A beer-soaked Buddha. My advice? Relax, be thoughtful, and try to have some fun. Do something that you’ll both look forward to. Concert tickets to a band that you both love? Romantic as heck. Dinner at a new restaurant in town that you’ve heard her mention more than once? That’s a win. I’ll leave the actual plans up to you, but the minimum requirements are the following: take a shower, comb your hair, remember to bring flowers, and wear your best Players Shirt. You’re a smart guy—I mean, you are reading my blog—so you’ll be just fine. There’s probably a question or two on your mind, though. 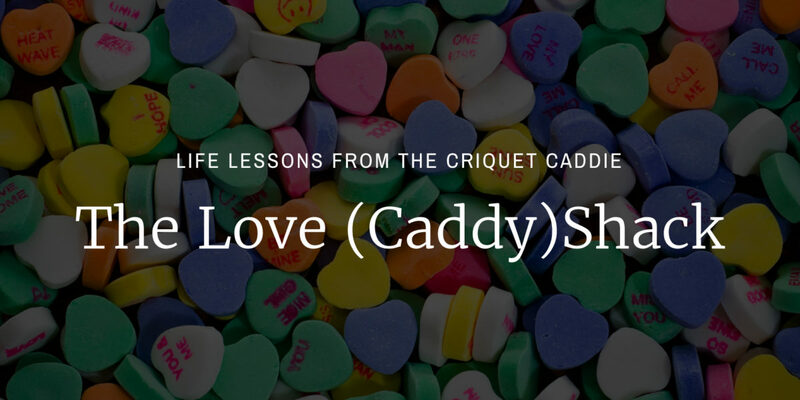 For example: What does a handsome, industrious, freewheeling caddie have in store for his one special someone this holiday? Great question. You’ll be surprised to learn that I don’t have anything romantic going on at the moment. I’m married to the game, as they say. But around this time every year, I remember Tina Spalding. I was working at Bandon Dunes over a summer, living out of an airstream in the Umpqua, surviving on largemouth bass and Red Hook…an idyllic albeit rugged period of my life. Tina, the head pro’s daughter, worked as a waitress to save up money before heading off to grad school. We were something of a classic match, Tina and I: she, the head pro’s daughter with the silky baby draw, and I, the outlaw up-and-comer yet to realize his full potential. Well we never got around to hanging out that summer. I always thought it was a little strange that every time I asked her out she had to cover someone’s shift. Apparently she had to work just about every night of the week. But that’s what made us the perfect match: we shared that tenacious all-or-nothing spirit. So our undying love has yet to be fulfilled, because true love waits. Until next time, Be the Ball.